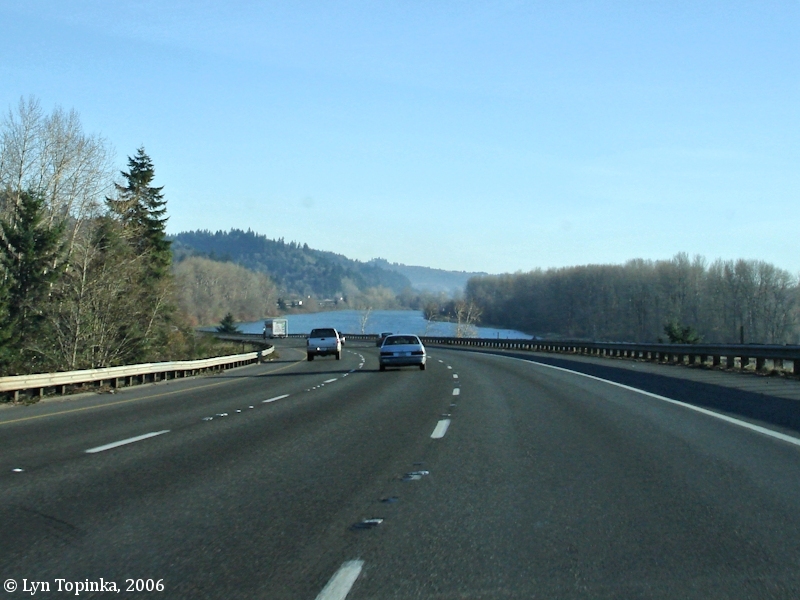 Lewis & Clark's Columbia River - "200 Years Later"
Click image to enlarge Martin Bluff and Interstate 5. View heading north as northbound lanes rise onto the bluff. 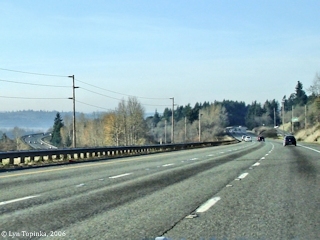 Southbound lanes (left) are seen descending the bluff. 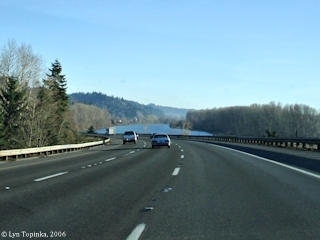 Image taken December 2, 2006. Martin Bluff is located on the Washington side of the Columbia River at River Mile (RM) 79. Upstream are Martin and Burke Islands and Woodland, Washington. Downstream is Kalama and the Kalama River. Across the Columbia on the Oregon side lies Deer Island. Today Interstate 5 passes across Martin Bluff, while the tracks of the Burlington Northern Santa Fe Railroad skirt the base. Martin Bluff is mentioned, but not named, in the 1792 journals of Lieutenant Broughton of the George Vancouver expedition. In 1805 Lewis and Clark made note of Martin Bluff as they journeyed down the Columbia. The "2 Small Island, below" refer to Burke and Martin Islands. "... Martins Bluff (Section 34, T.6N, R.1W): This settlement is 4 miles southeast of Kalama on the Columbia River, extreme southwest Cowlitz County. It was named by Northern Pacific Railway officials for William S. Martin who settled here in 1872. ..."
The Cowlitz County Washington GenWeb Project website however references Guy Ramsey's Postmarked Washington: Lewis and Cowlitz County (1978, Lewis County Historical Society, p.166) which lists William H. Martin as being the "Martin" the bluff is named after. "... Martins Bluff was located about four miles southeast of Kalama on the Columbia River. It was named for William H. Martin, who established a post office which operated here from 1868 to 1916. ..."
The U.S. Bureau of Land Management's General Land Records website (GLO) lists many Martins. GLO shows a William H. Martin gaining title to nearly 1,500 acres of Townships 5N and 6N and Range 1W, between 1865 and 1872, in particular parts of T6N R1W Section 34 (the area of today's Martin Bluff) between 1871 and 1872. GLO lists a William S. Martin as being granted title to 40 acres of T6N R1W, Section 28, on November 15, 1870, and William S. Martin and Richard Wilcox being granted title to 160 acres of T6N R1W, Sections 22 and 27, on December 9, 1871 (nearby the bluff). In the area of Martin and Burke Islands (T5N R1W, Sections 3 and 10), GLO lists William H. Martin begin granted title to 177.09 acres of T5N R1W, Section 10, on July 2, 1866, and a William H. Martin and Rhoda Martin being granted title to 443.19 acres of T5N R1W, Sections 3, 4, and 10, on September 20, 1867. William H. Martin was also granted title to 125.25 acres of T5N R1W Sections 2 and 3, and T6N R1W Section 34, on August 1, 1872. GLO also shows a couple of years earlier James A. Burk was granted titles to 59.86 acres of T5N R1W Sections 3 and 10, on April 1, 1865, 159.52 acres of T5N R1W, Section 10, on December 22, 1865, and 144.33 acres of T5N R1W Sections 2 and 3, on September 1, 1869. Burk also had numerous other listings for acreage in the area between 1865 and 1869. Other 1860s GLO listings for the "Martin" name in the area show title being granted to "Francis D Heirs of Martin" for 302.1 acres of T6N R1W, Sections 33 and 34, on September 20, 1867, "William L. Martin" being granted title to 40 acres of T6N R1W, Section 28, on December 20, 1867, and a couple of miles south "John G. Martin" being granted title to 194.17 acres of T5N R1W, Sections 25, 26, and 35, on July 2, 1866. The 1870 Cowlitz County Census shows no listing for any Martins or Burks (odd considering all of the GLO entries). The 1880 Cowlitz County Census shows a Rhoda Martin, widow, age 66, born in Ohio, and her son Willam S. Martin, farmer, age 33, born in Ohio, his wife Elizabeth, age 25, born in Oregon, and their two children Rosella, age 5, and Herbert L., age 2, both born in Washington State. The 1880 Census also shows James A. Burke, farmer, age 47, born in New York, and his wife Abbe Burke, age 37, born in Ohio, and their 12 children, ranging in age from 20 to one month, all born in Washington State. The 1854 cadastral survey (tax survey) for T5N R1W shows a "Martin" farming the southermost tip of what is today's Martin Island. Click image to enlarge Martin Bluff and Interstate 5, heading south. View heading south down off the bluff looking towards the Columbia River. Martin Island is on the right. Image taken December 2, 2006. All Lewis and Clark quotations from Gary Moulton editions of the Lewis and Clark Journals, University of Nebraska Press, all attempts have been made to type the quotations exactly as in the Moulton editions, however typing errors introduced by this web author cannot be ruled out; location interpretation from variety of sources, including this website author. © 2019, Lyn Topinka, "ColumbiaRiverImages.com", All rights reserved.